Creamy Firecracker Chicken Pasta – What's for Dinner Moms? But, we spent the better part of the weekend watching the snow fall (yes, ALL day Saturday), playing together and starting our Spring cleaning. This meant I wanted a simple meal for dinner. I love one pan meals! I did add a salad and green vegetable to the side for dinner but the main entrée was so simple that I didn’t even mind. This is one of those rare meals that everyone loved. It had enough heat that my son could add a little more hot sauce to his and be happy and just a hint of sweetness that my daughter could add just a touch more brown sugar to hers and be happy. Everyone wanted the leftovers for lunch too which is the sign of a good meal in our house! The dish is creamy with a bit of sweetness when you first taste it and then a bit of heat as it lingers in your mouth. It was perfectly balanced in to me on the sweet/heat. I served this dish with broccoli and a green side salad. For my mostly gluten-free son this can be made with gluten-free pasta. Add chicken, chicken stock, hot sauce, tomatoes, brown sugar and red pepper flakes to a large pot. Stir well to combine. Bring to a slow simmer over medium heat allowing the chicken to cook 8-10 minutes. Add the cornstarch and water (mixed together until cornstarch has melted) and the pasta to the pan. Stir well and continue to cook on lightly simmering, stirring often to keep pasta from sticking together. Once pasta has reached desired tenderness remove pan from heat and stir in heavy cream until well blended. Taste and adjust spices as needed. Add more brown sugar for a sweeter taste and more hot sauce or red pepper for a spicier taste. Serve pasta hot with bleu cheese crumbles sprinkled over the top if desired. Sounds like a good movie! Yumm creamy and delicious meal! Thank you so very much! The pasta was really, really good! Yum! Love the combination of sweet and spicy. Reads yummy! Making it tomorrow night! That’s amazing looking. I’m yet to watch Zootopia and am looking forward to it. Thank you! It was a very cute movie and both kids have said they want to see it again. This looks like it’s packed with lots of flavor. Definitely need to try! If you do I hope you like it as much as we did! This looks delicious! I love the idea of a little sweet and a lingering heat, with a pasta dish. I can see why everyone liked it 😀 Great recipe! Thank you! At first I thought it was too sweet but then once the heat seeped onto my tongue I thought it was perfect. This really looks good. I’m thinking about trying it but I can’t eat anything spicy however, my family loves spicy. I’m guessing the brown sugar will off set the hot sauce though. Also glad you liked Zootopia. I have heard great things about it we are planning to go this weekend to see it. The dinner looks good and creamy. Your family is lucky to have such a creative cook in the family. If you don’t like spicy I would separate a portion and add extra brown sugar and maybe a bit of cream. It will be sweet but it takes the edge off the spicy. Great work here.Am with you all the way. Very tasty recipe! Did you do gluten-free noodles for the kiddo? Yes. He is to the point now that he made the decision to go back totally GF as his stomach feels better when he does. Good decision for the both of you! This looks delicious! I’ll have to dial back the heat because my husband’s cancer treatments left his mouth really sensitive but I’m definitely going to make it! Definitely cut the hot sauce in 1/2 or so. Then you can add a bit more to yours on the plate if you want. Hope you like it! 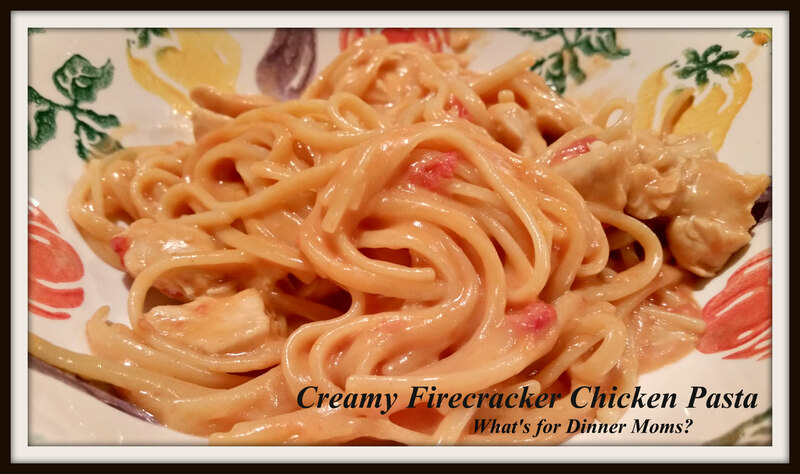 Pingback: Creamy Firecracker Chicken Pasta (revisited) – What's for Dinner Moms?